Report denotes leap in anti-Christian attacks in 2017. HYDERABAD, India (Morning Star News) – Hindu extremists in southern India issued harsh threats to Christians distributing Bibles before snatching their car keys, taking Bibles out of their vehicle and setting the Scripture on fire, sources said. Christians associated with Gideons International, all senior citizens, told Morning Star News that their advanced age did not temper the vitriol they received in Singotam village, Nagar Kurnool District, in Telangana state on Jan. 21. The video shows the group harassing Christians after one of the group snuck into the car, took the keys and tossed the Bibles out, which the group then began kicking. One of the assailants then poured fuel as his colleagues instructed him to pour it on the copies; he then lit a matchstick and set the Bibles on fire. The hostilities come after “one of the most traumatic” years of persecution of Christians, according to a report released last week by the Evangelical Fellowship of India (EFI). The Christians had obtained permission to distribute the Bibles at government-aided school in Singotam village from the headmaster. They had set out from Nagarkurnool at 11 a.m. and reached Singotam 90 minutes later, waiting another half hour for four other Christian associates, the group’s Richard Nixon told Morning Star News. They distributed nearly 170 Bibles, Nixon said. Five cartons remained with 80 copies of the New Testament in each, and they proceeded towards the town distributing the Bibles to shops and passers-by. Lakshmi is the Hindu goddess for wealth, and Narsimha is the Hindu lion god. They are regarded as husband and wife in Hindu mythology. A group of at least 10 Hindu extremists approached and ordered them to stop distributing the Bibles, Nixon said. The Christians had distributed Bibles in the area for 30 years without any opposition, said another member of the group, K.J. Anandham, a retired police sub-inspector. The extremists told them to leave, and they resumed their journey, stopping the car after about 800 meters to wait for their colleagues in the other car. 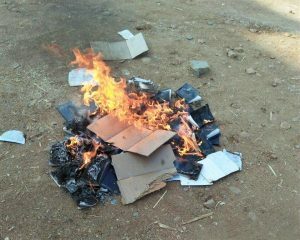 The extremists then set the Bibles ablaze. Area resident A. Navanitham saw the video and informed Kollapur police. Circle Inspector of Police Saida Babu told Morning Star News that officers registered a case, First Information Report No. 12/2018, based on Navanitham’s complaint and the video, and took the assailants into custody. A counter-charge, however, has been filed against the Christians, Sub-Inspector of Police G.V. Satyanarayana told Morning Star News. District Collector E. Sridhar was unavailable for comment. A legal expert who requested anonymity said police have taken the tactic of registering an FIR against “unknown” assailants. Section 295-A of the Indian Penal Code (IPC) outlaws “deliberate and malicious acts intended to outrage reli­gious feelings,” punishable by a fine, prison terms or both. There is no chance of intervention by the District Collector, since it is police who levy charges depending on the evidence, the source noted. Gideons associate Anandham said that three days after the incident, he and his wife were summoned to the police station. “Because of the complaint given by Navanitham, the police joined hands with Hindu extremists and are after us,” he said. He and his wife, both diabetics, were held at the police station all the day, he said. Navneet Chhabra, executive director of Gideons International in India, told Morning Star News that there have been several instances of people telling workers to stop distributing Bibles, though the workers are not assigned to religious conversion. Gideons workers politely stop distributing when people decline, he said. The organization has received letters from hospitals and jails from people who received the Bibles and whose lives the Lord has touched, Chhabra said. The incident comes amid a dramatic rise in attacks on Christians, according to a report released last week by the EFI. Last year EFI recorded 351 cases of hate and targeted violence against Christians, compared with 230 in 2016. States reporting most of the incidents were Tamil Nadu with 52, Uttar Pradesh with 50, Chhattisgarh with 43, Maharashtra with 38, Madhya Pradesh with 36, Bihar with 23 and Jharkhand with 17. With the exception of Tamil Nadu, the Bhartiya Janata Party – a Hindu nationalist party to which Prime Minister Modi belongs – rules, though it is part of a coalition in Bihar. Most of the cases documented consisted of physical violence and arrests at 110, followed by 70 instances of threat and harassment, 64 cases of disruption of church and worship services and 49 arrests on false charges. The report documents four incidents cases in which Christians lost their lives because of their faith. There were two instances where gender violence was used as a tool of persecution. The report notes that while incidents against Christians were evenly spread across the months of the year, “the prayerful period of Lent and Christmas, which involves larger participation of people,” also saw a higher targeting of Christians. The report documented 54 incidents in April and 40 in December. The report highlighted this trend in an incident in Satna, Madhya Pradesh, in December, when a mob of Hindu extremists beat members of a group singing Christmas carols and set their vehicle on fire. Christian children were also targeted in at least three separate incidents, all in Madhya Pradesh, when they were taken into custody and detained along with the adults escorting them to Christian Bible camps, according to the report. “In what seems to be a misuse of the provisions of the Freedom of Religion Act in Madhya Pradesh, at least three incidents (during the months of May, June and October) were reported from Madhya Pradesh where Christian children travelling for church related functions and their leaders were taken into custody on alleged charges of kidnapping and conversion,” the report states. “In one instance, the group was attacked by Hindu Dharm Jagran Manch activists, and it was more than a week before the Madhya Pradesh High Court handed over the children to their parents. The report acknowledged that it is aware of persecution and pressure directed at other religious minorities, as well as caste discrimination against Dalits and violence against women in general. Official figures from the government as put forth in the Parliament of India indicate that “communal violence” has increased by 28 percent in three years.